Brigid fixed her sombre gaze on the pony’s back. It must be like the wind, she thought. It would be like racing the wind. 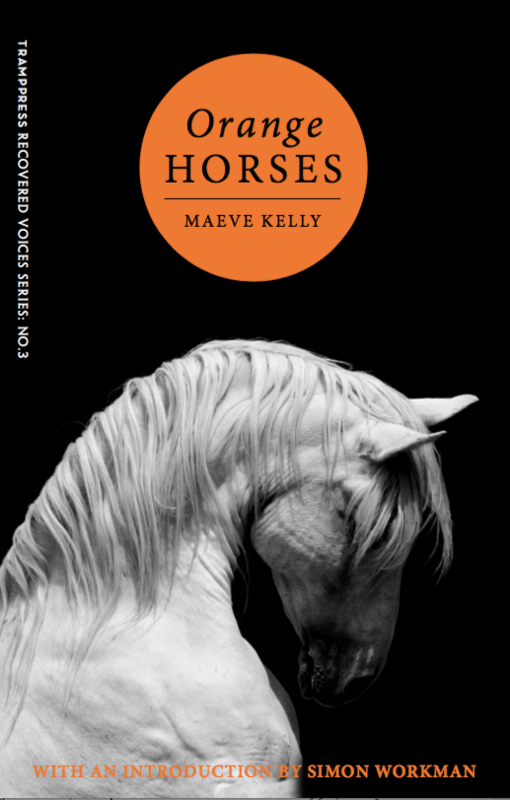 The third in our Recovered Voices series, Orange Horses is a collection of ferocious, witty, and thoroughly entertaining short stories. First published as a collection in 1990, they richly illustrate the plight of marginalised women in contemporary Irish society. From island life in the far west of Ireland, to dingy student accommodation in the centre of London, from the War of Independence to the IRA letter-bombing campaign in England in the 1970s, and from the impoverished life of rural farmers to the world of successful young writers and passionate artists, Maeve Kelly tells the stories of a diverse and fascinating range of characters. In charting their lives, she pivots from deep humanity reminiscent of Mary Lavin to a bleak incisiveness evocative of Edna O’Brien. Orange Horses is a beautiful, sad and funny collection of stories of the undervalued, the oppressed and the quietly heroic. Maeve Kelly, an Irish novelist, short-story writer and poet, was born in Ennis, Co. Clare and educated in Dundalk. She was a founding member of the limerick Federation of Women’s Organisations and the Limerick Refuge for Battered Wives, now called Adapt House, where she was an administrator for fifteen years. In 1972 she won the Hennessy literary award. She is the author of two short story collections, A Life of Her Own (1976) and Orange Horses (1990), a satirical fairytale, Alice in Thunderland (1993), two novels, Necessary Treasons (1985) and Florrie’s Girls (1989), and two collections of poetry, Resolution (1986) and Lament for Oona (2005). Kelly’s work has been translated into several european languages and has been broadcast on RTÉ and BBC. Kelly’s A Last Loving: Collected Poems (2016) was recently published by the Irish press Arlen House. Simon Workman lectures across several modules of english literature at Carlow College including: Introduction to literary Forms, Introduction to Modern Irish Poetry, Creative Writing, 19th Century american Writing, Victorian Poetry and Postmodern Fiction.